Let me begin by stating that I am not a professional, just a self-publishing writer who tends to obsess over grammar. Sometimes I offer to help people with editing – I can be very critical of grammatical errors in my reviews, but would prefer to fix the errors than complain about them. I don’t want to refer to particular style manuals. Publishing houses and editors have their policies and preferences. Self-publishers have the freedom to choose their own rules, but only within reason. I am writing this partly as a reminder for myself when editing. If it’s useful to you, then great. is used for contractions (e.g. : it’s only natural, isn’t it). as an alternative to left/right pairs of double quotation marks (e.g. : Mimicking their voices superbly, he continued, “Tom was furious, and yelled, ‘I demand to see the manager!’ The poor receptionist was in tears. ‘Please, sir,’ she said, ‘It was a mistake!’”). as an alternative to left/right pairs of single quotation marks (e.g. : written above the door were the words ‘Speak “Friend” and enter’). Here are 'plain single quotes' and "plain double quotes". Here are the left/right pairs of ‘smart single quotes’ and “smart double quotes”. Smart quotes read better than plain quotes. Plain quotes should not be used at all in the final publication. However, it may be simpler to use plain quotes during the early drafts. When using smart quotes, ensure that all apostrophes are a right single quote. A left single quote is used only to begin speech or a quotation. “But I’d've thought ’twas correct,” said our ‘great’ leader. ‘What did Tom say to the manager?’ I asked. Watch out for dialogue spanning multiple paragraphs. Speech at the start of a paragraph must have a quotation mark, but speech at the end of a paragraph should not have one if the next paragraph continues. Be especially careful where one person is relaying the speech of another. Let me indulge in an extract from my writing. Here Alyth is speaking throughout, so none of the paragraphs finishes with a single quotation mark, but all begin with one. ‘“I’m Alyth,” I replied nervously. She was wearing a black polo neck and dark jeggings, so all I could see of her was her hair and the faint glitter of her eyes. Quite sinister, in a way. Watch out for mismatched or inconsistent use of single and double quotation marks (e.g. : He said, ‘What?”). Watch out for spaces accidentally placed immediately inside quotation marks (e.g. : He said, ‘ What? ’). The biggest problem with apostrophes is when they’re missing, because the grammar and spellcheckers can miss these errors easily. For example: I watched the girls watch. Who or what was I really watching? Sometimes apostrophes are there when they shouldn’t be. In general, if there is an implication of belonging, there should be an apostrophe. 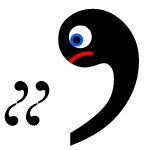 It’s very confusing, therefore, to use apostrophes to construct plurals of non-words (e.g. : DVD’s, CD’s, 1990’s); I don’t have an elegant solution for this, but I generally just add the ‘s’ without an apostrophe if I can’t rewrite to avoid the problem. Watch out for misplaced apostrophes that confuse singular and multiple possession. For example: The boy’s bad behaviour ruined the school’s reputation. In this case there is one boy ruining the reputation of one school. If there had been more than one boy at fault, it would instead be: The boys’ bad behaviour ruined the school’s reputation. There is some confusion arising from singular nouns which end in ‘s’. Should it be the goddess’s divine beauty or the goddess’ divine beauty? I prefer the former, but there are some cases where it’s very difficult to pronounce the resulting word, and some people omit it. The convention is to have commas separating speech from narrative (e.g., “Is it true,” he asked, “that dragons only exist in fables?”). It’s a good rule, but shouldn’t necessarily be extended to short quotations (e.g. : His cry of ‘No!’ echoed down along the canyon; the sign on the door had the words ‘Keep Out’ in large red capital letters). ‘Perhaps,’ he said, frowning uncertainly. ‘It’s certainly possible, and if the train were to be delayed’ – and the subtle look he gave me suggested that maybe I could assist the train somehow in being late – ‘then I would say there’s a very good chance indeed!’ He leaned back with a satisfied expression. ‘Switch the TV on,’ he reached for the remote control. Finally – last, but not least – there are certain words that cause a plague of errors. These are words of belonging but do not have an apostrophe. e.g. : Whose poetry is this? I don’t like its rhyme. These are contractions, ‘it’s’ meaning ‘it is’ or ‘it has’, ‘who’s’ meaning ‘who is’ or ‘who has’. These are contractions for ‘they are’ and ‘you are’. Often confused with there (indicating location), their (indicating ownership) and your (indicating ownership). e.g. : They’re not going to your place, you’re going to their place. This entry was posted in Writing and tagged apostrophe, copy-editing, dialogue, grammar, quotation marks, quotes, speech. Bookmark the permalink.